Weather hampers S Korea ferry search Jump to media player Difficult weather conditions have hampered the search for survivors of the South Korean ferry disaster. 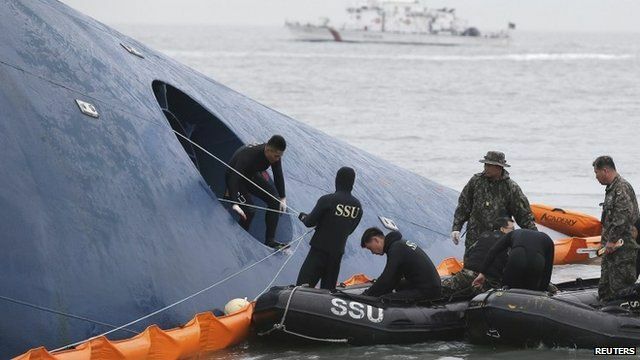 Hundreds missing as S Korea ferry sinks Jump to media player A major rescue operation is under way after a ferry carrying more than 470 people sank off the coast of South Korea. Aerials show frantic ferry rescues Jump to media player Aerial footage shows rescue teams attempting to save passengers aboard a ferry which sank off South Korea. Footage from boats shows ferry rescue Jump to media player South Korean coast guards have made a number of dramatic rescues after a ferry carrying 459 people capsized and sank off South Korea. South Korea ferry search goes dark Jump to media player A major rescue effort is under way after a ferry carrying 459 people capsized and sank off South Korea. South Korea ferry rescue footage Jump to media player A major rescue operation is under way after a ferry carrying 459 people capsized off South Korea, coastguard officials say. Difficult weather conditions have hampered the search for survivors of the South Korean ferry disaster. Emergency services are continuing to look for nearly 300 people, still missing after a ferry carrying more than 470 sank off South Korea. It is still not yet known what caused the incident, but there is a growing sense of anger as reports emerge that people were told to stay in their seats when the ship ran into trouble. Lucy Williamson reports from Jindo.